Shihan Teruyuki Okazaki 8th Dan. Interview By David Palumbo Snr. 'Blast from the past'Report from 1971 JKA Championships. Shotokan News and Reports from around the World. E.T.K.F. European Championships.Report By Clare Worth. Seiji Sugimoto 5th Dan. Profile on a Champion. By Robert Curtis. Senseis ASAI, YAMAGUCHI, KATO -Course Report. Returning to Source.By Ian Deavin. Sensei Enoeda's Crystal Palace Course. Report By Jim Wood. 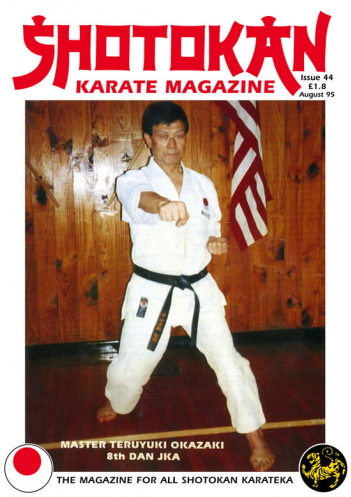 You will probably have realised by the front cover that this issue features yet another legendary figure from the Shotokan karate world. The famous Master Teruyuki Okazaki 8th Dan JKA, who has been based in America since 1961 and heads one of the largest Shotokan organisations in the world, the I.S.K.F. (International Shotokan Karate Federation) and Chairman of the newly formed JKA/WF. This interview, done exclusively for SKM by David Palumbo, was recorded at Master Okazaki's dojo in Philadelphia. I'm sure all Shotokan practitioners will enjoy this interview very much. It sheds so much light on the development of Shotokan and there are great stories about the early days with Master Funakoshi and Master Nakayama. Some very interesting points emerge and historical and technical information that I think many Shotokan karateka will appreciate. Master Okazaki paints a picture of how karate was just after the war and how it has changed. I watched the interview on video and it was so apparent how much love and respect Master Okazaki had for his instructors. 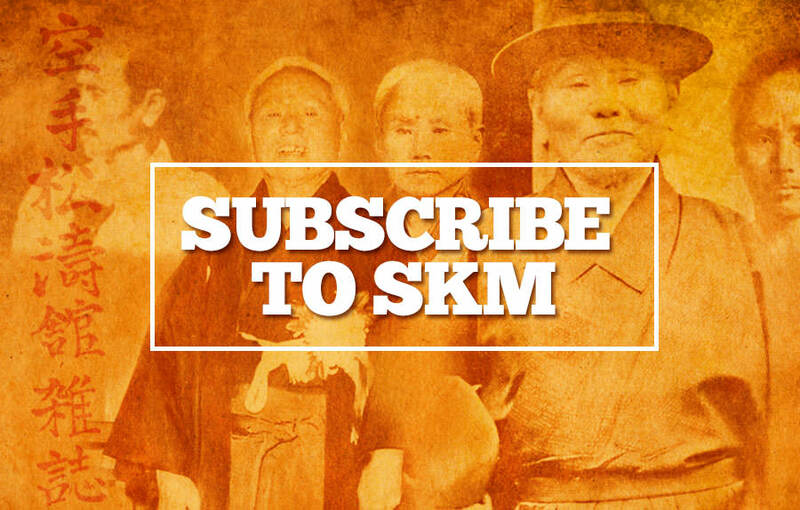 SKM would like to thank Master Okazaki for his time and David Palumbo for his continued interest and support with supplying material for the magazine. I really enjoyed preparing and reading the historical piece, 'Blast From The Past', which is basically a report on an old 1971 J.K.A (Japan Karate Association) Championships.You would be amazed how many people ask about old JKA events. Shotokan students who are interested in the history of our art are always writing in asking if there is more old JKA Championship material, films etc., available. There probably is in Japan, but unfortunately it is hard to get hold of. Another legendary Shotokan Master, Hidetaka Nishiyama 9th Dan was in England recently for the E.T.K.F. Championships (the European section of Nishiyama Sensei's I.T.K.F.) There were some unusual events in this very Traditional Championships and I think they will be of interest to readers. For instance, there was one event, 'team kata' where after performing the kata, the team captain then has to do the bunkai (application) against the other two team members and they are scored on the overall performance; the kata and the bunkai. Many people will think that this is a great idea as a Traditional karate competition event and this type of contest could catch on with many of the top Traditional organisations eventually. Another Japanese Instructor is featured in this issue who may not be known to the vast majority of karateka. His training is, considering the fact that he has been a Champion and still competes at a high level, very traditional. Seiji Sugimoto 5th Dan was a student of Master Hirokasu Kanazawa and graduated from the S.K.I. Instructors course programme. Good training. Editor. RELAXATION - TENSION' 'CONTRACTION - EXPANSION'. WHAT IS THE DIFFERENCE? By John Cheetham. If you study the photo's of Kanazawa Sensei you can see a perfect example of the principle of Relaxation - Tension which is of course a most important and integral point in execute karate techniques. Without this interaction of the muscles you will never have smooth and fluent body movements and achieve explosive, destructive, focused power in your techniques - Kime. However there are times during the various KATA where the absolute opposite physical situation occurs. This is known as Expansion - Contraction or the other way around, Contraction - Expansion, where energy is stored in the tensed state of the muscles like a compressed spring (contraction) then released (expansion). For good effective karate you must be able to utilise both forms of energy and both ways of making power in your techniques. If you have seen or remember very early competition fighters in action you will recall that there was virtually no moving around certainly not like today's hyperactive, bouncy athletes you so often see at tournaments. The early fighters used more of the Contraction - Expansion principle, whereas now the complete opposite of Relaxation - Tension is used. You could argue all day which is the better method but here we will just focus on the differences which are vast. any experienced karateka do this quite naturally after many years training. It is easy to understand if you relate the idea to a very tightly compressed spring and how it would explode on release. This should be the very same 'feeling' that your body experiences in the Contraction - Expansion theory, which certainly does and should occur in the Kata, which after all are the very heart of Traditional Karate. Kata is the SOUL of karate. Relaxation - Tension is certainly easier to both understand and put into practice with good effect. 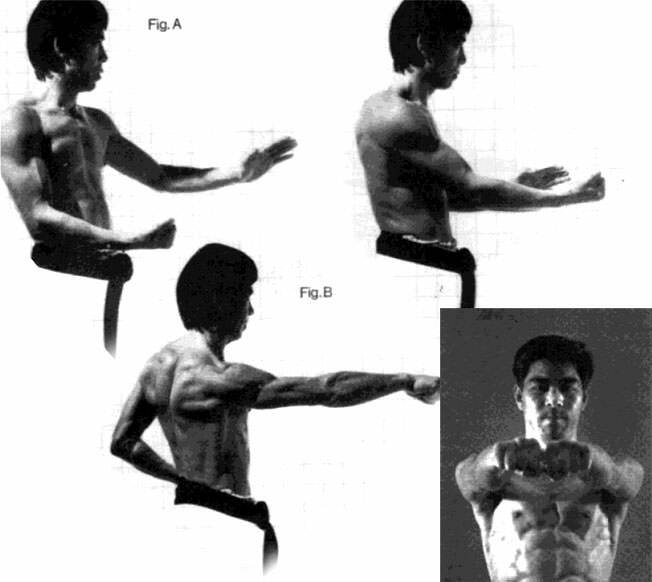 It's impossible not to see the difference in the muscular state of Kanazawa Sensei in the photo's. He literally goes from one extreme (top) to the other (bottom). One important point is that in the top photo where he is relaxed, there will be one part of his body that is not totally relaxed. The HARA, lower abdomen, the muscles immediately above the pelvic bone. The body's energy centre. So, although the outside appearance is of total relaxation, the body centre will be like the compressed spring about to explode. This is a point worth thinking about very seriously for traditional karateka. Many of the Japanese Masters, especially the older ones have complete control over this most subtle of body conditions. Sport karate people would not have any tension in the lower abdomen (Hara - compressed spring), their movements are totally 'athletic' and do not use 'stored energy. Techniques are thrown from a completely relaxed state. Interestingly, I have heard many times that Boxers always maintain some degree of contraction - tension in their stomach even though their arms - shoulders and torso are as relaxed as possible until impact when muscles naturally contract. Observe anyone hitting a 'bag' and this occurs quite naturally. In a boxers case this stomach tension could be because they could take a body blow at any time. Boxers definitely use the Relaxation - Tension theory. Many Traditionalists will argue that the Contraction - Expansion method is the only way and that otherwise it is Sport karate! Well, if that is the case then what is Kanazawa Sensei showing in the photo's? You cannot get a more Traditional Instructor than someone of Kanazawa's reputation. Also, if you take a hypothetical situation, say for instance, you are sitting quietly and peacefully at a bar or somewhere and you were suddenly, violently attacked for no particular reason and totally unprepared, you would hardly have time to 'Store Energy' as in the compressed spring theory. You would simply have to respond the best way you possibly could from your relaxed state! However, if you had been aware of impending danger then it is possible to use contraction - expansion, you would have the necessary time to prepare even if it was only a few seconds. As with the majority of Technical articles and Technical arguments there is, as the old saying goes; "More than one way to skin a cat." However, as Traditional karateka it is our duty to preserve the old ways and as one of Master Funakoshi's three precepts and 'musts' during Kata performance, he said that you must use the correct 'Expansion and Contraction' of the muscles during Kata. This occurs many times during the Shotokan kata, even in the Heian kata although it is very difficult for beginning students to understand and perform. In Heian Yondan when you perform the slow double wedge block (kakewaki uke) in back stance, here you are storing energy like compressing the spring, followed by an explosive (release) front kick and double punch. Anywhere this type of slow deliberate movement occurs, which is numerous, then you are, or should be, using the contraction - expansion theory. However, if you are using a spinning or turning movement then tension would hamper the smoothness and fluidity of your movement and this is where relaxation is very important. You would turn or spin as smoothly as possible then focus (tension) on completion of the technique. I think most instructors want students to relax during transitional movements (from one technique to the other) otherwise speed and balance will be affected. Many times students should also study the principles of the karate movements and dynamic forces involved as well as the necessary breathing and footwork, as well as the actual techniques, which without the basic principles of karate are useless! For instance, anyone can throw a punch but if you have studied the simple basic principle of the build up of dynamic forces e.g. good connection to the floor - rotate the body first, arm fires out second etc., you will generate more power in the action. Contraction - Expansion is a very subtle way of making explosive power and it must be preserved in Traditional karate. To explain verbally is incredibly difficult which is why you never read about it in karate books, or rarely. Probably the only way is to relate and compare the body condition to a compressed spring which stores massive energy, 'Contraction'.The release of the spring is simply 'Expansion'. Coupled very closely with this theory is utilising TORQUE with various body movements, which is very difficult to explain in physical terms as related to karate. When I trained in America with Lee Scott a student of Nishiyama Sensei he told me that he'd been watching the old JKA films (Tape 3 SKM Videos) and he couldn't believe how Sensei KASE used 'Torque' in such a subtle way without an obvious hip action. Yet, he said that 'inside' KASE was like an exploding compressed spring. He was torquing up his spine from the inside to generate his unbelievable power. When you watch Sensei KASE even today his remarkable movement is still a mystery to most people. Purposely make a 'VERY' short forward stance (zenkutsu dachi), really short, say, maximum two feet in length, this is for practice purposes as you will see. Start with left leg forward then change over. Tuck in your tailbone at the very bottom of the spine which will tighten the lower abdominal muscles and buttocks. Make sure your 'back' foot is completely facing forwards, the way you are going, along with your front foot. So, your back knee is also facing perfectly straight. If you don't do this with this exercise you will not experience 'Torque' and miss the point. Now, twist your right hip and especially the right thigh muscle (and upper-body which should work in synchronisation with this action) slowly back to hanme, half or 45 degrees from front facing but keep tucked in and hips on an even plain. MOST importantly 'DON'T' alter the position of your back knee, it must keep perfectly straight or you won't 'Torque' up the thigh muscles of the right leg. Obviously don't move your back foot either or it will affect the knee position. What you now should be feeling, which is probably 'strange' to many students, is like a 'compressed spring' like feeling in your back leg thigh muscles which want to release the tension and slam forward in conjunction with the hip. Well, hopefully that's what you should be feeling. Then practice your basic gyaku zuki in the same fashion, using 'Torque' from the upper thigh and hip, using both methods: Relaxation - Tension, Contraction - Expansion. hope this article sheds some light on the difference between Relaxation - Tension as opposed to Contraction - Expansion, (and when/how they are applied) which can be quite confusing to many students. Enjoy your training, it's forever! !